Hello everyone. Wow what a forum this is! !..I currently model in 009 but since coming across you guys ( And indeed dolls I see) I am shortly to change gauge. At least I can get some detail in in this size. Why are your locos called Critters?..I haven't twigged. I need to branch out! Okay so I think I want to make a Beyer Peacock Wren type Critter? for starters so will have to swat up on where to get a general line drawing of one and then probs power it with a Smokey Joe or something. I was reading Shozo's blog on making stub turnouts and want to have a go at that as well. I am racking my brains trying to think of a theme for a micro layout. Maybe a bomb factory or something. What I like about everything you do is your imagination and the degree of weathering something so convincingly to look like a right heap!!.. There are some really talented and clever modellers amongst you and I just love it. I like this scale as you can make what you want and from what I have read, KIND replies are in abundance and thats what modern modelling needs now to keep it going. Praise and interaction. I talk too much but I hope I will be made welcome. A real name is always nice if you'd be kind enough to share it. Rust Boiler wrote: Why are your locos called Critters?..I haven't twigged. I need to branch out! I think that Critter is an American slang word used to refer to insects and/or very small animals. Therefore a loco that is a Critter is a very small loco. Most minimum gauge locos are very small compared to those on broader gauges and so are critters. Your bomb factory idea seems most original. Perhaps taking a look at the Woolwich Arsenal 18in gauge system would be helpful for inspiration. Sorry...Of course I will share my name. Thanks for replying. This is going to be a good adventure. I [i]think[/i] that Critter is an American slang word used to refer to insects and/or very small animals. Therefore a loco that is a Critter is a very small loco. Most minimum gauge locos are very small compared to those on broader gauges and so are critters. Thanks for getting back. Last night I ordered two books from Amazon. 15" gauge railways and the 18" gauge railways authored by Mark Smithers. Got the two used for 40 quid which seemed good. They are both highly praised by your forum members so before I get the files out I need to know a bit about what I am on about and get some ideas. I know I want a continuous run circuit with the back half covered with buildings and then some opening doors where critters can suddenly appear and do their stuff crossing over stub points. That sort of idea..
Is it okay to build a Beyer Peacock Wren which is 18" gauge ( I Think) but to run it on 15" gauge ( oo track ) or is that a no no? Once you get the books I'm sure you'll find some (lots) of inspiration. Regarding your about Critters here's a comprehensive definition from across the pond. Rust Boiler wrote: Wow what a forum this is!!.. And Wow what a cast of characters we are! Hey, welcome aboard to the great ship of unfinished projects. An old American Sage of "Critterdom", one Bobber Gibbs used to say... I don't know how to define a critter, but I know one when I see one! Getting both Smithers books for only £40 IS a good deal. Whilst the Heywood book has been reprinted as a soft back and can be had new for about £20 the 18" book is often £40 on its own - and that's if you can find one. Well done. And yes, if you want your Wren to run on 15" that's just fine. It's the wild west of modelling here, anything goes. Critters and what rail code? Okay , thanks everyone for making me feel really welcome. Thats nice. Will just have to get used to the site and navigating where to reply but I think I have got it now. RE " Critter", I think I understand now. It's simple. I am 63 and get to work under my own steam, I have less than 4 wheels and weigh less than 3 tons...that makes me an old Critter yes? or is that a Codger?..perhaps we could get together and design a Codger! Glad it makes no odds if I can run an 18" gauge Wren on 15" gauge track. No rivet counters here...damned good policy! I am going to make my own track and have read that code 55 is the right stuff for 00 gauge. Can anyone advise please? I just want it to LOOK like miniature gauge track and that an OO chassis will run okay on it as well. I would like to use wooden sleepers. What are you using as spikes to hold the rail down? Someone is going to say RAIL SPIKES!! !....what I mean is where do I get them from please?...Has anyone done this? Hi Pete, code 55 rail is well to small. About the smallest you could use for a (small) loco worked line is code 83 (N ) which works out about around 12 - 16lb /yard. But that would be almost impossible to spike. Code 100 (bog standard 00) works out around 20lb /yard, which would be typical of "Jubilee" type portable track. Spikes used to be available from Peco, whether they still are I dont know, another source was the 7mm Narrow gauge Soc. I'm sure some one else will put you right track! If you use the search facility for "track" you'll find loads of stuff. Hi Trevor. WoW West Africa?..you guys are global!! Re: Rail, now that you mention code 100 that rings a bell. I use code 80 for 009 and I did think when I read about code 55 that it would be too small. Good job I checked and thanks for spiking me in the right direction! Thing is with this hobby, as you know, if you don't ask questions you can make "expensive mistakes" and I am still doing just that. What I HAVE learnt is that it is all very well making a nice running loco , alias Critter but the track work has got to be accurate, flat, clean, well assembled and correctly wired before we can hope for any trouble free running. Oh for a layout that everything runs dead slow, no catches, sudden death stops and the need for 'God's" finger to help things along. I think you know what I mean. 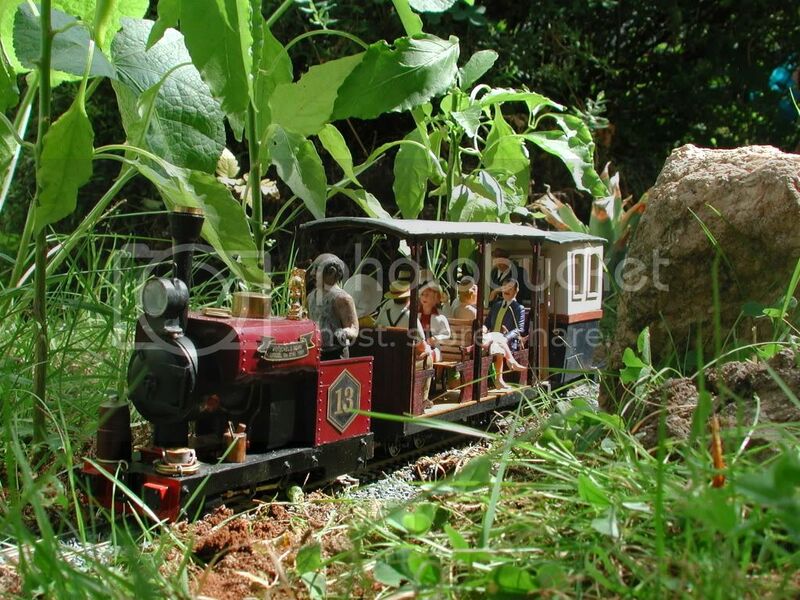 My little red saddle tank loco, built by Gerry Bullock on a Fleischmann Magic Train drive, even runs on temporarely improvised track in my garden. Looking at all those Wren-pictures, I might invest in a roof for the driver one of these days. Juergen, thanks for your reply and picture of your Wren. This is JUST EXACTLY what I want to build. I like your model a lot. Thanks also for the tip about RC operation. I may consider that later but stick to basics for a starters. It is very exciting to converse with people on this forum that live in all parts of the world. It is the friendliest forum I have ever clicked on and so pleased to be a member. I was in Die Vaterland for 16 years mostly Paderborn. Ich vermisse die schone ( Leider ohne umlaut!!) Deutche Bier und Schnapps!! THanks for that Catweasel I will order some in. Great tip as it's sometimes hard to pin down!! where to get these things!! !